Ease the burden of communication for your deskless workers and volunteers. Whether they be full or part time, with odd hours or rotating shifts, this new cloud-based platform works across desktop computers, smartphones, and tablets to enable easier access for staff to interact with managers, calendars, and team communication. StaffHub is useful for employees in retail stores, museums, theme parks, conventions, hotels, restaurants, manufacturing, and more. Any service-related employee who doesn’t have his or her own computer can benefit from the ease of communication created by StaffHub. Using StaffHub, employees are able to request time off, communicate directly with coworkers,and swap shifts. For example, if someone needs to swap a shift, they will send a request out to a specific employee or group of employees. Then, when a shift swap is accepted by the employees, it goes to the manager for a final approval. For managers, creating a schedule is as simple as possible. They can add colors and/or labels for different types of shifts (open, night, etc.). Additionally, managers can add notes for each shift, such as reminders of new work to be completed. Microsoft also tries to cut the time it takes to create a schedule by allowing managers to copy previous versions. From here, the schedule can be updated as necessary, such as handling time off, vacation, sick leave, or shift swaps that are requested through the app. StaffHub also allows different types of files to be uploaded. For example, employees can upload photos to ask the manager or other employees a specific question. Like everything else, this can be sent to individuals, group chats, or everyone. Managers can take advantage of the ability to upload and share different files by including, for example, a PDF of an employee handbook, a welcome video, or a list of common rules. Microsoft explains that the videos will display inline when clicked, made specifically for convenient smartphone access. 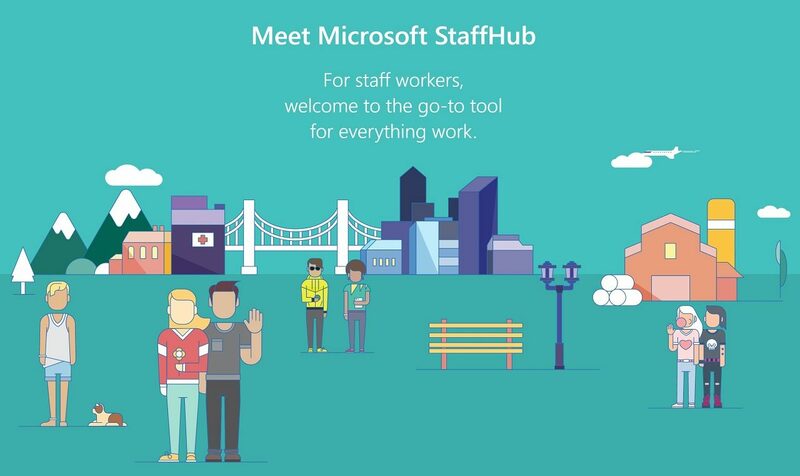 StaffHub is a free add-on to Microsoft’s Office 365 suite, and is available to those who have the Office 365 K1, E1, E3, and E5 plans, including the education version of these plans. As for the staff workers, they don’t need to purchase an Office 365 plan. The StaffHub app for iOS and Android is free to download. StaffHub is available in Chinese (simplified and traditional), English, Spanish, Russian, Japanese, French, Brazilian-Portuguese, German, Korean, Italian, Dutch, Turkish, Swedish, and Danish. But again, the business must have an Office 365 subscription. For those businesses that would like to sign up for Office 365 to use StaffHub, let’s take a look at specific pricing plans. Would you like to discuss how we can help you get started? Office 365 Enterprise K1 is your cheapest option at only $4/month per user. Like the other plans, it requires an annual commitment, but if your main goal in buying an Office 365 plan is for StaffHub, this is your best bet. It’s made specifically for all employees to benefit from increased productivity, including those without a desk or office. Designed to improve communication and collaboration for workers who use a shared PC or don’t have a work computer at all, it’s easily the plan you should choose for these types of employees. As you can see, the 2GB inbox is very small for a business email, but it’s one of the reasons this option is so low cost. Keep in mind, front-line employees can use StaffHub for communication and scheduling. So, the small storage is acceptable for employees without a work computer. Office 365 Enterprise E1, E3, and E5 each requires an annual commitment and is $8/user/month, $20/user/month, and $35/user/month, respectively. All of these plans include services that are in the K1 plan, plus more. These plans are designed more for traditional office workers with computers. A detailed comparison chart is listed on Microsoft’s website. Because of the numerous differences, I’ll tell you only about some important ones. As you can see, there are quite a few differences between these plans and the K1 plan, mostly related to conferencing, file storage, and email storage. The E1 plan gives its users only a 50GB inbox, while both the E3 and E5 plans have unlimited inboxes. Another notable difference is that the E1 plan only comes with online versions of Microsoft Office programs, whereas both the E3 and E5 offer fully installed Office applications (Word, Excel, PowerPoint, Outlook, Publisher, OneNote, Access, and Skype for business) on up to five PCs or Macs per users and up to five tablets and five phones per user. Click here for more information on differences between the plans.